Meet Conway. 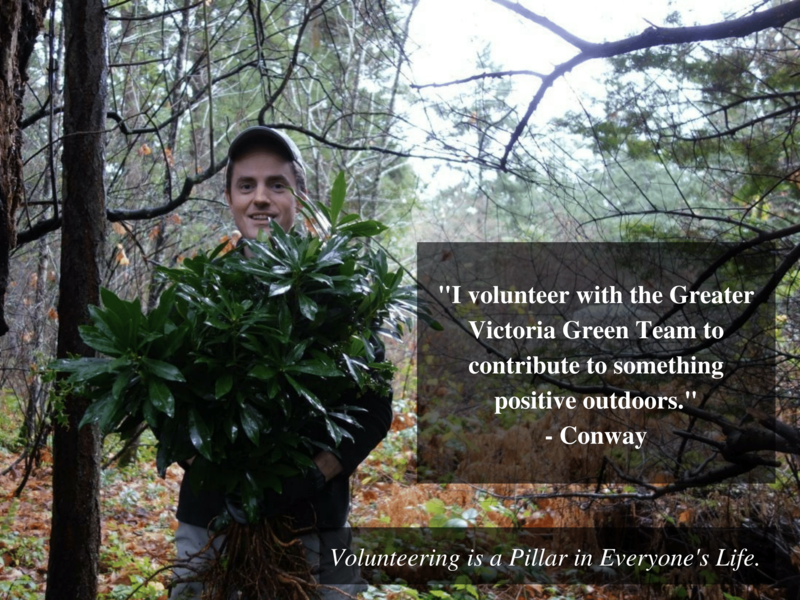 Conway has been volunteering with the Greater Victoria Green Team (GVGT) since August 2014. He attended the GVGT’s very first volunteer event at Point Ellice Park in Victoria! He has been a friendly face at many of GVGT’s volunteer events – often volunteering a dozen times per year! His quick wit and humour cause much laughter at our events! “Hello, this is Conway reporting in. I’m 33 years old, and have “the knack” for all things electrical and mechanical. I was built from the bones of the world’s greatest scientists and engineers, but was never designed to be human. When not working or disciplining my renters for leaving all the cupboards doors open, again, I can sometimes be found playing volleyball or pulling plants out of the ground. 1) The snacks and swag. 2) Getting to contribute to something positive outdoors. 3) The cats. All production ceases when a neighbor cat comes to say hi. 4) It’s a great venue to meet new people. 5) I can use the root puller to take down invasive trees. Given that I probably spend as much time volunteering with the GVGT as I do shopping for groceries, the impact that the events have on my life perhaps isn’t great, but I can say that it’s a wonderful conversation starter with pretty much anyone. Turns out learning the difference between daphne and rhododendrons is more interesting than which bulk almonds and peanuts are on sale this week. To join Conway at an upcoming GVGT volunteer activity, please head to our Meet-up page here.